Housse pour piano droit Yamaha There are 2 products. 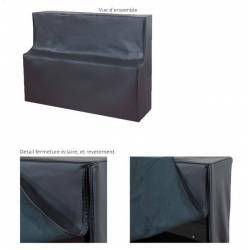 High quality cover for upright piano.Perfectly adapted to the dimensions of the Yamaha U1, or any piano of equivalent size.Piano dimensions:Width < 122 cmHeight < 153 cmKeyboard depth < 62 cmOuter: waterproof and durable faux leather. High quality cover for medium or large size upright piano, such as the Yamaha U3. Piano dimensions: Width < 132 cm Height < 153 cm Keyboard depth < 65 cm Outer: waterproof and durable faux leather.